The MacArthur Museum of Arkansas Military History, in partnership with the Arkansas History Commission, will host a free workshop on researching military records on Saturday, August 16th from 10 a.m. to 12 p.m. The museum is located at 503 E. 9th St. in downtown Little Rock’s MacArthur Park. Most people today have family members who served in the military, from the Civil War, through World Wars I and II, to the present. Participants of this workshop will learn where to begin their research on finding records that pertain to a family member’s military service. With new technology and the internet, researching personal records has never been so easy. However, these venues will not help if a person does not know where to go to begin the search. This two hour workshop, conducted by Arkansas History Commission staff, will educate the public on resources available to research military records. The MacArthur Museum of Arkansas Military History relates the military heritage of Arkansas and its citizens to a diverse and widespread audience. Located in the historic Arsenal Building in MacArthur Park – one of Central Arkansas's oldest surviving structures and the birthplace of one of this country's foremost military heroes – the museum collects, preserves, and interprets our state's rich military past from its territorial period to the present. The Arkansas History Commission is one of the oldest existing state agencies in Arkansas. As the official state archives, created by the General Assembly in 1905, the Commission has a wealth of resources on the history of Arkansas from territorial days to the present. With select military records from every war from the 18th century to the mid-20th century, more than 4000 manuscript collections, and 3000 newspaper titles from 1819 to the present, the State Archives has the largest collection of Arkansas history material anywhere. For more information, contact Rachel Miller at the MacArthur Museum of Arkansas Military History at (501) 376-4602, or by email at rmmiller@littlerock.org . The Arkansas History Commission can be reached at (501) 682-6900, or by email at state.archives@arkansas.gov. 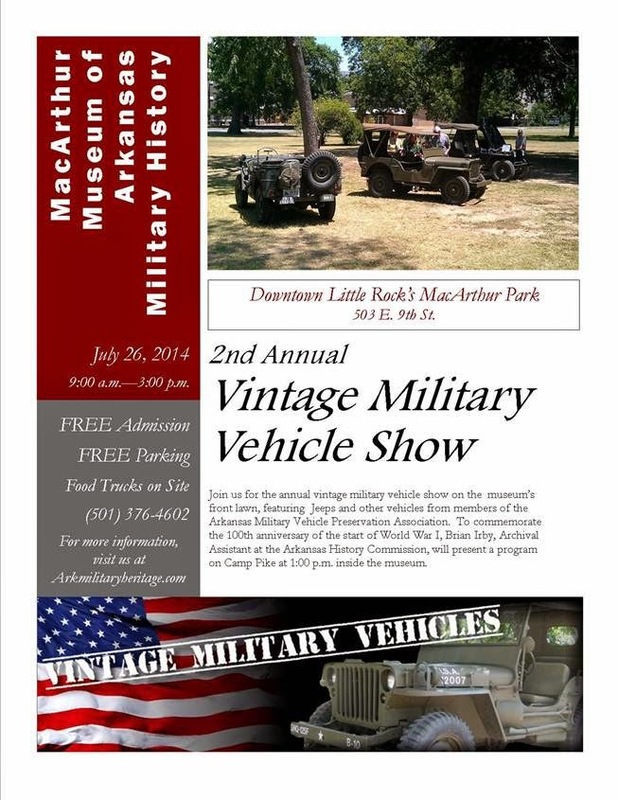 On Saturday, the MacArthur Museum of Arkansas Military History will be hosting their 2nd Annual Vintage Military Vehicle Show. At 1:00, Brian Irby will be talking about Camp Pike and Arkansas during the First World War. We hope everyone will come out and enjoy what promises to be a great event with a really interesting presentation! We wanted to share some pictures of some of the work we do behind the scenes. In the below photographs, one of our archival assistants, Crystal Shurley, is processing the Steve Carrigan collection. Carrigan was a well-known attorney in central Arkansas. Crystal noted that some of the most interesting parts of the collection are several rare books, including "The Aftermath of the Civil War in Arkansas" by Governor Powell Clayton, "Birds of America" by John James Audubon and a book written by Clarence Darrow, perhaps best known for his role in the Scopes Monkey Trial. Our own Brian Irby will be speaking at two different events in July! At 1:00, Saturday, July 26th, Brian will be talking about Camp Pike during World War I at MacArthur Military Museum's Vintage Military Vehicle Show. He will also be speaking to the White County Historical Society at 7:00 p.m., Monday, July 28th at Harding Place in Searcy. The topic will be the 1912 Arkansas Senate race. Newsletters, Online Collections and Acquisitions...Oh My! Our newsletter, the Arkansas Archivist, is out for the month of July! We're talking about our social media networks and the relaunch of our online digital archive, so be sure to check it out! We've also added a new collection to our online digital archive - Arkansas Flags. In 1912, the United States Navy commissioned the USS Arkansas battleship, for which the Pine Bluff Chapter of the Daughters of the American Revolution wanted to present a stand of colors. Surprised to find that there was no state flag for Arkansas, the Pine Bluff Chapter and the Arkansas Secretary of State office organized a contest for Arkansans to submit designs for the new flag. The Secretary of State office received 65 entries, of which Willie K. Hocker’s design was the winner. The AHC has 47 of the 65 potential state flags in our collection, digitized here for public use. This is just the first 11 of those 47 flags, but keep checking back as we add more! Arkansas in War and Reconstruction, by David Y. Thomas, Ph. D.
The Arkansas Archeologist, Vol. LII for 2012 and 2013. The Arkansas Historical Quarterly, Vol. LXXIII, No.1, Spring 2014. Ouachita County Historical Quarterly, Vol. 45, No. 4, Summer 2014. Supplement to Rector/Alcorn Scrapbook – 0.01 cu. ft.
Arkansas Department of Parks and Tourism records – 18 cu. ft.
Arkansas State Board of Embalmers and Funeral Directors records - 0.02 cu. ft.
Tristan Green Papers, 16 cu. ft.
Hempstead County marriage licenses, pre-1875 – 0.25 cu. ft.
Hope Chamber of Commerce records from 1994, 0.4 cu. ft.
Powhatan, Ark. - The Arkansas History Commission and the Northeast Arkansas Regional Archives (NEARA) will be hosting the annual NEARA symposium on Saturday, August 2 from 10 a.m. until 2:45 p.m. at the Male and Female Academy at Powhatan Historic State Park, where the Northeast Arkansas Regional Archives is located. The symposium’s theme, “Boom or Bust: Commerce and Development in Northeast Arkansas,” will feature presenters, Dr. Lisa Perry, Brian Irby, Bryan Pierce, Anna Westman and Steven Saunders, who won this year’s NEARA research award. Topics will include Dissecting Davidsonville: A Postmortem of Arkansas’s First 9 Blocks, Digging the Natural State: Mineral Extraction and Economic Development, Tales from the Archives: Creating Lesson Plans for Arkansas Educators and Struggles & Second Chances: The Development of Agriculture in Northeast Arkansas. For more information about the symposium or to register, contact April Goff at april.goff@arkansas.gov or by phone at 501-682-6891. We get a lot of questions about a lot of different things each week. We receive some of our questions through social media and others through phone calls and visits. There tends to be a core group of questions that we are most frequently asked, though. We thought it might be helpful to share answers to a few of those frequently asked questions. 1. Do we have birth or death records? Although we have a lot of records, unfortunately we don’t have birth or death records. Arkansas wasn’t required by law to have birth or death records before 1914. The Vital Records Department under the Department of Health has birth and death records for Arkansas after 1914, but we don’t. However, we do have an index to death records after 1914 of names and dates of death. We also have something called prior birth records. Prior birth records are birth certificates or records for people born before 1914. People born before that year could apply to receive what was essentially a delayed birth certificate. 2. Do we have Civil War Union Army records? We don’t have Union Army pension records. Those are Federal records and they can be found at the National Archives in Washington D.C. We do, however, have Union Army service records on microfilm and Confederate records for Arkansas, including pension records and service records. 3. Do we have records relating to Native Americans? We have a copy of the Dawes Roll, which was essentially a census of Native Americans in Oklahoma in 1900. And we have some unofficial records and some books addressing general Native American history as well. But we don't have the in depth research materials on Native American history that other institutions have. In fact, we really encourage you to contact some of those other institutions specializing in Native American history. The two that immediately come to mind are The Sequoyah Research Center (which is in Little Rock) http://ualr.edu/sequoyah/ and the Oklahoma State Archives (in Oklahoma City)http://www.odl.state.ok.us/oar/ . Both of these institutions are wonderful repositories of Native American history and our colleagues at these institutions are incredibly helpful and very knowledgable. You can also try to contact individual tribes for more information. The Arkansas History Commission will be closed Friday, July 4 and Saturday, July 5 for the holiday. We hope everyone has a safe and fun holiday weekend! !